This is the South edition of a two volume guide. Written and published in association with the Countryside Commission and the Ordnance Survey, it claims to be the �official guide� to the Pennine Way. Where other writers draw their own large scale maps, this book does give you the support of the genuine 1:25,000 OS version, in a strip alongside the route finding instructions. It�s a shade unfortunate that the book�s size is at the outer limit of what can be called a �pocket guide�, and you might find it�s not really convenient to handle as you walk along. 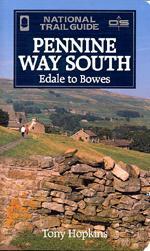 Tony Hopkins divides the Pennine Way into 19 daily sections, ten of them appearing in this volume. Route finding and personal commentary are interwoven, and there is no way of instantly identifying one from the other when you face navigating decisions. Fortunately, the instructions are crisp and they are linked to the accompanying map by a simple reference system. Hopkins�s commentary fills you in with a wide variety of interesting information on the landscape. Some of this merits separate full-page study, and this is sensible because you can enjoy it at leisure. There are, for example, sections on peat (of which you will see a lot), the limestone pavement of the Yorkshire Dales, the Brontes of Haworth (you will pass Withens, believed to be the inspiration for Emily�s Wuthering Heights). It�s an attractive book. The maps give it a thread of colour, enhanced by some fine colour photographs. On Page 45, for example, get a feel of the blanket bog waiting for you on the South Pennine tops. The Useful Information section outlines the availability of public transport at key points along the route, and gives contact details for the appropriate Tourist Information Centres. There is a bibliography. This is a good practical guide. You can share the writer�s interests in everything there is to see in the landscape and know at the same time that he has his eye on the path.